Andrew was a excellent and informative guide who shared his extensive knowledge of the northern lakes with us. We ended the tour feeling that we had been shown this beautiful part of Lakeland as only a native of the area could have done. Thank you, Andrew, for a wonderful day. TOUR GUIDE RESPONSE: Hi Pasherin, Thank you for your feedback and touring with me. It was a wonderful day and great to be able to get off the beaten track in the north Lakes. If we could give more than 5 stars, we would. Our guide, Andy, was friendly, knowledgeable, entertaining, and he even laughed at our jokes. The route he took us on and the stops he suggested made our trip through the Yorkshire Dales everything we had hoped it would be. Great fun. TOUR GUIDE RESPONSE: Thank you for your kind words! It was a pleasure to meet you all and share this beautiful part of the world. Wonderful guide who met all of our needs. Did the best we could with the weather. TOUR GUIDE RESPONSE: Thank you and you are all now honorary members of the West Yorkshire gongoozler club! Great guide. Really enjoyed his low profile and sense of humor. He was very knowledgeable and responded extremely well to our requests and limitations. The tour gave us a great introduction to the area. Would highly recommend. TOUR GUIDE RESPONSE: Daniel, Thank you for your review it was wonderful to meet you all and do something a little different. I always welcome an opportunity to explore off the beaten track! Pleased you enjoyed your time here and best wishes to all. Wonderful tour - wonderful guide! My husband and I hired Andy for two full days - one day was the Beatrix Potter tour and the other was the Lake District Explorer tour. There is no way that we could have possibly done all that we did with Andy in those two days if we had tried to do it on our own. He tailored the days to our particular interests, which included some hiking and some amazing sites. We were able to really enjoy and get the most out of our short visit thanks to Andy. We highly recommend him! We spent 2 days with Andy and would highly recommend him for anyone wanting to make the most of their time in the area. Please see my comment for the Lake District Explorer tour for more details. 5 out of 5 for Andrew and our tour of the Lake District. Andrew showed us the best views and sights and made sure we got to the places we wanted to see. Andy was a fantastic tour guide. Not only was he able to keep me away from the masses of tourists, he showed me tons spectacular scenery. He also knew copious amounts of the history of the areas he took me to. I would wholeheartedly recommend him as a tour guide to anyone who truly wants the Lake District experience. A great experience and Andy was good plus friendly. He gave us more than we expected and was flexible to adjust to some changes in the timing/schedule. The tour itinerary is excellent and the coach is comfortable. Well done, Andy. 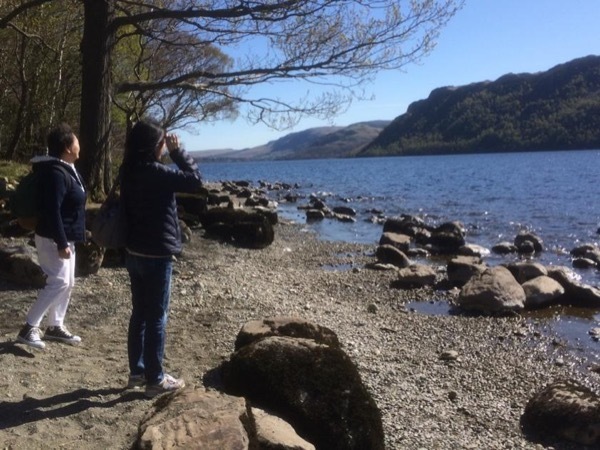 Andy made certain that I got to see the places I wanted to for as long as I wanted to, out of the norm taking me to Ruskin's house, Rydall Falls, Dove Cottage exhibition as well as the places artists painted in the breathtaking environment of the Lakes District. I highly recommend Andy and his ability to shape your personal tour as you wish.Also he is knowledgeable, friendly and a good traveling companion. Was well worth the $$ and I got a full day's tour with no omissions. Wonderful person and great guide!